Castle Design offers a beautiful collection of mantels for you to choose from. Whether you are building your dream home, or remodeling an older home, we can help you select the perfect mantel. Our Paintable Gypsum Stone Mantels are available in several distinct designs that are the perfect centerpiece for any interior room. 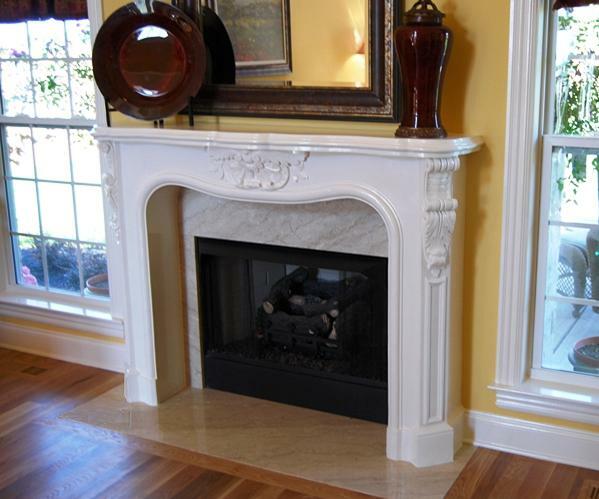 Gypsum Stone Mantels are hand-crafted to create a smooth white surface and may be painted or faux finished. Paintable stone mantels are easy to install, requiring only simple tools and limited skill. Each mantel surround is non-combustible and has a Class II Fire Rating. This eliminates there being any space required between the mantel and the firebox. Many of our stone mantel designs allow optional selections of corbel, applique, and rosette combinations that give you the opportunity to create a unique stone fireplace surround. Our beautiful mantle shelves and decorative corbel brackets allow you to create a mantel that is unique to you! Our mantels are cast with a specially formulated Hydrocal™ gypsum cement and are reinforced with hemp fiber to create an extremely hard surface that is also rich in design detail. Our stone fireplace mantel designs are relatively lightweight, which makes preparation and stone mantel installation much easier than other stone mantels. Some mantels in our portfolio are finished and installed, but this is not included in our listed prices. Mantels are delivered unfinished. This allows you to create the exact look you are hoping to achieve. Our website also offers a Mantel Specifications Chart and an Installation Guidelines for Fireplaces. This allows you to determine the exact size mantel you need for your home as well as see exactly how easy it is for you to install one of our mantels. If you have further questions or would like to speak with a member of our design team, please contact us! We look forward to working with you!